Please join us for the artist’s talk and discussion, which is scheduled a few weeks prior to the opening of the show, Seven Minutes on the B67. We will be adding climate pledges to a collaborative sari during the talk. Details of the project are below. Open Source Gallery presents Seven Minutes on the B67, a site-specific installation and social practice project by Monica Jahan Bose. Monica Jahan Bose’s work explores ideas about climate change and community by linking together communities across international borders as well communities very near each other. Seven Minutes on the B67 focuses on Brooklyn, connecting Bangladeshi immigrants in the Kensington neighborhood with the residents living near Open Source Gallery in South Slope. Seven Minutes on the B67 is part of Bose’s ongoing Storytelling with Saris art and advocacy project. In this project, Bose uses the sari–eighteen feet of unstitched hand-woven cotton–to represent women’s lives and the cycle of life on our planet. Multilingual writing and text, especially by women, are emphasized as tools of empowerment and climate resilience. Through her work, Bose underscores the importance of feeling connected as a community, both locally and globally, in addressing climate change. 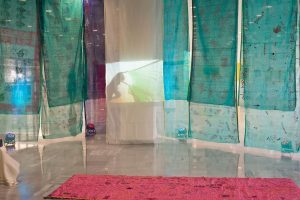 Bose creates collaborative saris using imagery and words about climate change with women from her ancestral community, Katakhali Village on Barobaishdia Island in Bangladesh, as well as with communities in the US and Europe. Through performances and art actions, participants learn climate mitigation and adaptation strategies, such as using public transportation, trying new farming techniques, and exchanging light bulbs and appliances with higher efficiency products. The saris are created by interweaving Bose’s woodblock designs with writing, drawing, and painting created by participants. While working on the saris, participants discuss climate change and, if they reside in wealthier carbon-producing communities, write pledges on the saris to reduce their carbon footprint. The climate pledge saris are ultimately returned to Bangladesh to be worn as garments by the women of Katakhali. 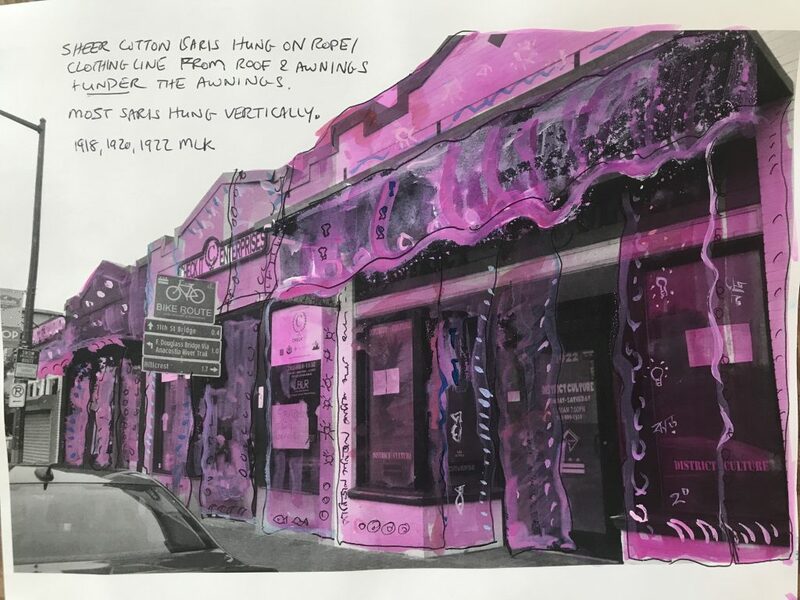 Seven Minutes on the B67 includes a sari workshop in Kensington with the Bangladeshi Ladies Club, a talk on May 3 at the gallery, a community iftar for the opening on May 22, and a closing climate art action on June 29. Monica Jahan Bose is a Bangladeshi-American artist and climate activist who has exhibited her work extensively in the US and internationally, including eighteen solo shows and numerous group exhibitions. Through over twenty performances and dozens of art actions, Bose has engaged thousands of people. Her ongoing feminist collaborative project, Storytelling with Saris, has traveled to ten states and several countries and been featured in numerous publications and TV and radio programs. Her work has appeared in the Miami Herald, the Washington Post, the Brooklyn Paper, Art Asia Pacific, the Milwaukee Sentinel, the Honolulu Star Advertiser, the Japan Times, and all major newspapers in Bangladesh. In 2019, she created a large-scale public art project called WRAPture in Washington, DC. She has a BA in the Practice of Art (Painting) from Wesleyan University, a post-graduate Diploma in Art from Santiniketan, India, and a JD from Columbia Law School. This program is supported, in part, by the National Endowment for the Arts, the Joseph Robert Foundation, and the New York City Department of Cultural Affairs, in partnership with the City Council. Open Source Gallery programming is made possible by the New York State Council on the Arts with the support of Governor Andrew M. Cuomo and the New York State Legislature. Special thanks to Arts & Democracy, Bangladesh Institute of Performing Arts, and the Bangladesh Ladies Club for their support and participation in this project. The Window invites you to the opening of the project SUBSISTENCE, by Monica Jahan Bose in collaboration with Anju Chaudhuri. Curated by: Catherine Bay. SUBSISTENCE: The project interrogates the ideas of need and consumption and its impacts on climate change and food security, particularly on vulnerable coastal communities. While richer people consume too much of everything and thus use huge amounts of fossil fuel, many people in the world subsist on the bare minimum. “Subsistence” means sustenance in French. In English we use the term “subsistence” to speak of the minimum needed to survive, as in “subsistence farmers,” who grow food and fish and survive on what they grow and catch. Monica Jahan Bose’s collaborators in Bangladesh are women farmers, who are struggling to survive because of climate change. Climate change is reducing rice and vegetable production (from salination of soil and change in weather patterns), fish catch in the tropics (because the water is too warm), and yield of eggs, milk, and meat (successive frequent storms cause farm animal and poultry disease and death). SUBSISTENCE occupies and activates the space of The Window and the adjacent pedestrian street and community with video, installation, performance, conversations, and a culminating shared meal created by the artist (on June 8). The Window vous invite a vernissage de SUBSISTENCE, une exposition et action artistique autour du changement climatique et son impact sur l’agriculture de l’Asie du Sud. SUBSISTENCE est une collaboration entre Monica Jahan Bose et Anju Chaudhuri. Monica Jahan Bose: Née en Angleterre du parents bengalis, citoyenne du Bangladesh et des États-Unis, Monica Jahan Bose est une artiste, avocate et activiste. Les moyens d’expression utilisés dans son oeuvre sont nombreux: peinture, film, photo, gravure, performance, et son approche est pluridisciplinaire. Dans cet esprit, elle tente de marier l’art et la politique. Elle a eu des expositions ou a fait des installations au Brooklyn Museum, Art Asia Miami, le Twelve Gates Gallery, la Musée nationale du Bangladesh, the DUMBO Arts Festival, (e)merge art fair, SELECT Art Fair Miami, Smithsonian Asia Pacific American Center, entre autres. Actuellement, Bose vit et travaille entre Washington, D.C. et le Bangladesh. Elle a fait ses études à l’Université de Wesleyan (USA) ainsi qu’au centre artistique renommé du Santiniketan (Inde) et a reçu son diplôme en droit à l’Université de Columbia (USA). Elle a vécu à Paris de 2006–2010 et, pendant cette période, a fait des expositions personelles à la Galerie Deborah Zafman ainsi qu’à l’UNESCO, et elle fut sélectionnée pour l’exposition du Prix Marin en 2010. L’oeuvre de Bose a été reconnu par de nombreuses entités. Elle a reçu quatre bourses de la part de la DC Commission on the arts and humanities (par le biais du U.S. National endowment for the arts) et elle a crée une performance pour la Nuit blanche Washington DC (2015). Elle est la créatrice de Storytelling with Saris, un projet artistique collaboratif mené avec son village ancestral de Kathakali au Bangladesh, mariant ensemble son histoire avec l’art contemporain pour attirer l’attention sur le fait que son héritage et son village est en danger de se noyer sous l’Océan Indien. Anju Chaudhuri: Née à Calcutta (Inde) d’une famille d’intellectuels bengalis attachés à la tradition, Anju Chaudhuri vit et travaille a Paris. En Inde elle s’est nourrie des histoires de la mythologie hindoue qui baigne sa vie quotidienne, et par ses nombreux voyages entre mer et montagne. Après son diplôme de peinture à Calcutta, elle part très jeune étudier à la St-Martin School of Art à Londres, puis aux Beaux Arts à Paris et ensuite à Amsterdam. Maître de la gravure, Anju Chauduri a appris cet art aux côtés de Stanley William Hayter (Alelier 17, à Paris). Elle est connue pour ses peintures, gravures, aquarelles, dessins, et papiers. De ses nombreuses rencontres, elle a gardé le goût des amitiés profondes, des rencontres dans tous pays et continue – depuis Paris où elle a choisi de s’installer – à aller de Berlin à Amsterdam rencontrer des peintres, ses pairs, trouver des médiums, vivre en un mot « en Peinture ». Elle puise son inspiration dans la Nature et dans les 5 éléments : air, feu, eau, terre, éther. Au cours des dernières années, elle a commencé à se préoccuper du dérèglement de la nature par l’homme et a commence à créer des oeuvres autour du sujet du réchauffement planétaire. Primée de nombreuses fois, elle a fait maintes expositions, en France ainsi qu’à l’étranger. Ses oeuvres se trouvent dans les collections de nombre de musées dans le monde, comme Asia Society (NY), Ville de Paris, Bronx Museum (NY), Victoria and Albert Museum (London), et National Gallery of Modern Art (New Delhi). Monica Jahan Bose: Born in Britain, Monica Jahan Bose is a Bangladeshi-American artist, lawyer, and activist whose work spans performance, painting, film, photography, printmaking, and interdisciplinary projects. Her solo projects and performance/installations have been presented at the Brooklyn Museum, Art Asia Miami, Twelve Gates Gallery, the Bangladesh National Museum, the DUMBO Arts Festival, (e)merge art fair, SELECT Art Fair Miami, the Smithsonian Asia Pacific American Center, and many other venues. Bose currently lives and works in Washington, D.C. and Bangladesh. She studied art at Wesleyan University (USA) and Santiniketan (India) and has a law degree from Columbia University (USA). She lived in Paris from 2006-2010 and had solo and duo exhibitions at Galerie Deborah Zafman and UNESCO and was selected for the 2010 Prix Marin Exhibition. Bose has received numerous commissions and awards, including four grants from the DC Commission on the Arts and Humanities (through the U.S. National Endowment for the Arts) and a 2015 commissioned performance for Nuit Blanche DC. She is the creator of STORYTELLING WITH SARIS, a longterm collaborative art and advocacy project with her ancestral village of Katakhali, Bangladesh. In December 2015, Bose partnered with the International Centre on Climate and Development to create a climate awareness workshop in Katakhali, Bangladesh. As an artist originating from Katakhali, Bose brings her history into contemporary art, translating these experiences into immersive site-based work. Her heritage and community may drown under the Indian Ocean. Born in Calcutta, India to a family of Bengali intellectuals enamored of tradition, Anju Chaudhuri lives and works in Paris. She grew up in India, nurtured by the Hindu mythology that permeates daily life, and her many journeys between the sea and the mountains. After receiving a diploma in painting in Calcutta, she left at age 18 to study at St Martin’s School of Art in London, then continued at the Ecole des Beaux Arts in Paris, and then in Amsterdam. Chauduri became a master printmaker, learning this art by working side by side with Stanley William Hayter (Atelier 17, Paris). She is renowned internationally for her paintings, prints, drawings, watercolors, and hand-made paper. She takes her main inspiration from nature and the five elements: air, fire, water, earth, and aether. She has felt increasingly alarmed by the disruption of nature by man and has begun creating works responding to climate change. She has exhibited extensively in France and internationally and received numerous awards and commissions. Her works can be found in the collections of several museums throughout the world, including Ville de Paris, Asia Society (NY), Bronx Museum (NY), Victoria and Albert Museum (London), and National Gallery of Modern Art (New Delhi). 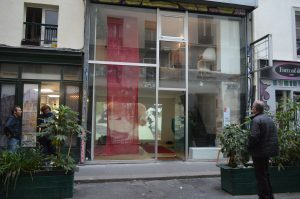 The Window invites you to the closing performance for the project SUBSISTENCE, by Monica Jahan Bose in collaboration with Anju Chaudhuri and other residents of Paris. SUBSISTENCE: The project interrogates the ideas of need and consumption and its impacts on climate change and food security, particularly on vulnerable coastal communities. While richer people consume too much of everything and thus use huge amounts of fossil fuel, many people in the world subsist on the bare minimum. “Subsistence” means sustenance in French. In English we use the term “subsistence” to speak of the minimum needed to survive, as in “subsistence farmers,” who grow food and fish and survive on what they grow and catch. Monica Jahan Bose’s collaborators in Bangladesh are women farmers, who are struggling to survive because of climate change. Climate change is reducing rice and vegetable production (from salination of soil and change in weather patterns), fish catch in the tropics (because the water is too warm), and yield of eggs, milk, and meat (successive frequent storms cause farm animal and poultry disease and death). SUBSISTENCE occupies and activates the space of The Window and the adjacent pedestrian street and community with video, installation, performance, conversations, and a culminating shared meal created by the artist.